A new video content pack for social media pages like Facebook, Instagram and Twitter has been launched by WhiteboardVideoBox. It is ideal for business owners wanting to engage more of their audience and make more sales. Social Video Pack has been launched by WhiteboardVideoBox, allowing business owners to use social media to get a rush of free traffic, engagement and exposure. The pack provides “done for you” social media video content that allows business owners to make more sales through their social media accounts. WhiteboardVideoBox created the Social Video Pack so that more businesses could use social media effectively to engage their audience. 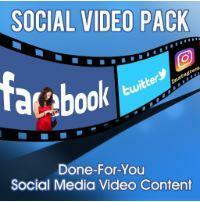 For those who have been searching for hours to find the perfect content for their Facebook, Instagram, and Twitter accounts, Social Video Pack is ideal. With the growth in popularity of video, it’s become the fastest and easiest way to get noticed across all social media profiles. Great video content is a highly effective way of engaging an audience, and the importance of video is only trending up. However, it’s time consuming to create and edit videos, and many people don’t possess the skills or knowledge to create engaging videos. Now, with Social Video Pack, even those without experience can use video across their social media channels. Customers will get access to 30 videos in landscape format and 30 videos in square format, meaning all they need to do is upload them and link their website, and they’re done. These videos have proven extremely popular on Facebook, and now businesses can use them for their own ends on all their social media profiles. With 78% of people watching videos online every week, it shows how important video now is for businesses wanting to engage their audience in the most effective way. Social Video Pack is ideal for businesses in any field and can quickly help to make an impact on any social site.